Een Poolse verzetsstrijder en een Duitse SS-officier in één cel in de stalinistische gevangenis – ongeveer negen maanden zaten Kazimierz Moczarski en Jürgen Stroop in dezelfde ruimte, allebei in afwachting van de voltrekking van hun doodvonnis. Waar praten de slachtoffer en de beul over als zij allebei weten dat hun dagen geteld zijn? Interview met de beul van Moczarski is een indrukwekkend literaire non-fictie boek dat de gruwelijke en absurde geschiedenis van de twintigste eeuw samenvat. Waarom is het boek nog niet in het Nederlands vertaald? 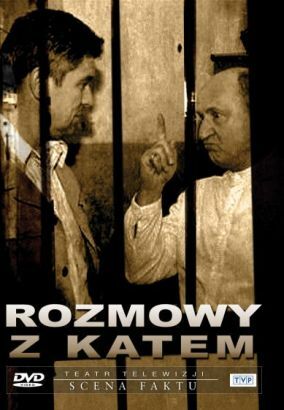 On 2 March 1949 Kazimierz Moczarski, a former member of the resistance, was locked into a Polish jail cell already occupied by two profoundly sinister men. One of them, Gustav Schielke, had been a former policeman and later a low-level officer in the SS. The other was Jűrgen Stroop, an SS general and the liquidator of the Warsaw Ghetto whom Moczarski had once tried to kill. 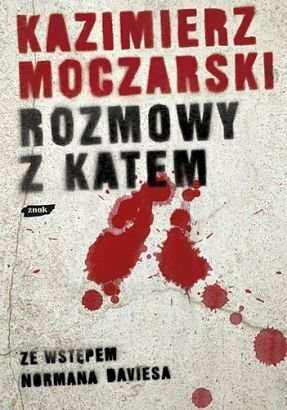 For 255 days Moczarski shared a small cell with the mass murderer. His Stalinist jailers thought that this would break him. Instead, as both men were convinced they would be condemned to death, they were able to talk believing that neither would break any confidences. This book is the record of these prison conversations. Moczarski charts the events that caused a seemingly unexceptional German youth to become a passionate Nazi, an unswerving follower of Hitler and Himmler and, at various times, the SS overlord in Greece, the Ukraine and Czechoslovakia. The book largely retains the original conversational tone, increasing still further the drama of the situation. Moczarski is not merely a passive chronicler, but, as a witness to Stroop’s crimes, remains an aggressive opponent and continues to pursue Stroop’s replies. Schielke, the third man in the cell, provides a different perspective – that of the German mixed up in the Nazi world. Schielke thus is frequently critical of Stroop and his colleagues and has his own stories to tell. The major section of the book is a day-by-day account of the Nazi liquidation of the Warsaw Ghetto. Stroop had been specially groomed for this task and he was sent to Warsaw to carry it out. Already hundreds of thousands of Jews had been sent to the extermination camps – now the Nazis wanted to remove the last remaining Jews from Warsaw. Himmler was only expecting the “Grossaktion” to last a few days, but because of the bravery of the Jews, galvanised by the Jewish Fighting Organisation, it lasted nearly a month. Even after this, when Stroop symbolically dynamited the Great Synagogue, some Jews fought on for many months. Stroop admits that about 70,000 Jews were killed as a result of his action. The SS General has, however, great respect for his enemy, even though he still stresses that German scientists have shown that Jews are not human beings, having different blood and tissue from the rest of humanity. Moczarski’s background as both a lawyer and a journalist equipped him perfectly for his role and his eye for detail and fluency resemble the style of Kapuscinski. Numerous theatrical and radio performances testify to the dramatic power of the book, which is added to by Moczarski’s occasional confrontations with Stroop and by his touches of irony. 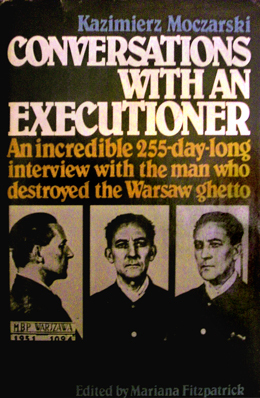 “Conversations with an Executioner” then reads very easily, but remains one of the most illuminating titles ever published on the nature of Nazism. Kazimierz Moczarski was born in Warsaw on 2l July 1907. He graduated with a law degree from Warsaw University in 1932, having undergone military service. After continuing his studies at the University’s School of Journalism, Moczarski went to Paris to study international law at the Institut des Hautes Etudes Internationales for two years. Later he worked at the Ministry of Welfare dealing with legislation concerning conditions of work. During the German occupation Moczarski was an active member of the Home Army, working in the Bureau of Information and Propaganda (B.I.P.). He played a major role in the investigation of collaborators, heading the Investigation division in the Resistance. One of the actions he organised was the springing of over a dozen prisoners from an armed hospital in June 1944. During the Warsaw Uprising he was in charge of one of four radio stations organised by himself and he was the editor of “Wiadomosci Powstancze” (the daily newspaper of the Uprising). For his activities he was awarded the Gold Cross of Merit. In mid-October 1944, after the total destruction of Warsaw by the Germans [or Nazis? 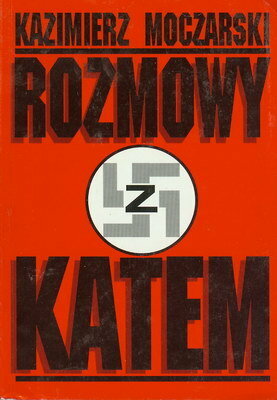 ], Moczarski re-activated the Home Army information and propaganda centres in Kraków and Czestochowa. On 11 August 1945 Moczarski was arrested by the new Communist authorities, which had started a campaign to eradicate all potential opposition to their power. Most former Home Army leaders were arrested: some were simply murdered, others were imprisoned, tortured and faced show trials, frequently being accused of collaboration with the Nazis. 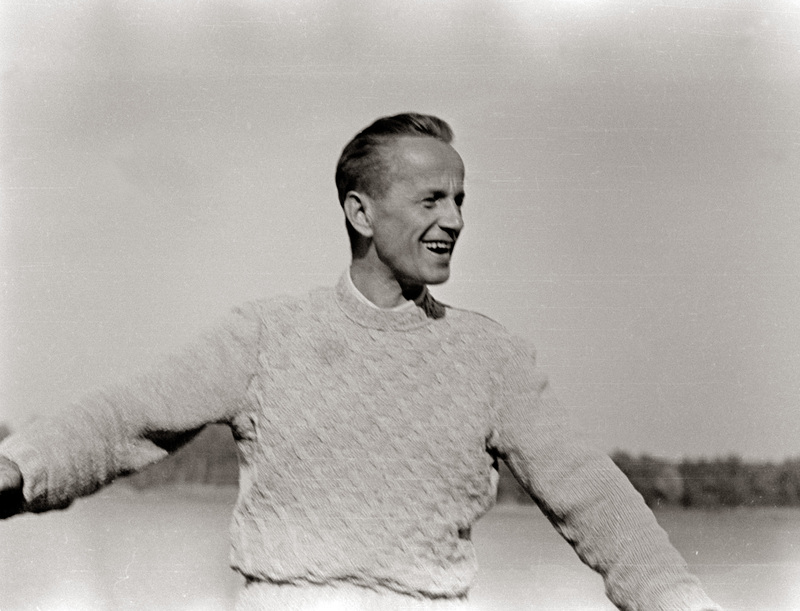 In 1946 Moczarski was sentenced to 10 years’ jail, which was later reduced to 5 years. In 1949, at the height of Stalinism, a new series of interrogations was started against him and he was sentenced to death in 1952. In a letter to the court Moczarski lists 49 methods of torture used against him. His confinement with Stroop during this period was one of the methods his jailers used to try to break his will. In “Conversations with an Executioner” Moczarski mentions Stroop’s walks, parcels from home, personal library and right to receive and to send letters, all privileges denied to him. After Stalin’s death in 1953 his sentence was commuted to life imprisonment, but he was not informed of this for another two and a half years. After his release Moczarski worked as a journalist for many years. He also adroitly used the margins of available freedom to champion various social causes. In 1968 he was removed from his job when he spoke out in defence of his Jewish colleagues at the time of the Communist Party directed anti-Semitic purges. Kazimierz Moczarski died in 1975. Zbigniew Herbert dedicated his poem “Co Widziałem” (What I Witnessed) to Kazimierz Moczarski. Dit bericht was geplaatst op februari 28, 2015 door Stichting Literatura in Uitgever gezocht en getagd als Conversations with an Executioner, doodstraf, Getto van Warschau, Interview met de beul, Kazimierz Moczarski, tweede wereld oorlog.